Now, don't die of shock, yes, that is a scrapbook page you are seeing on my blog. The impossible does happen occasionally! 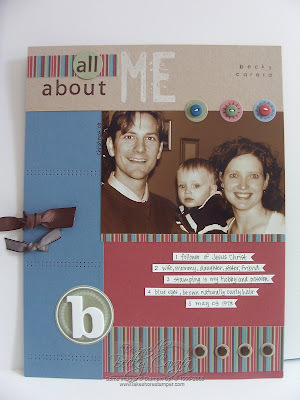 Today's Stamp Something challenge is to make a scrapbook page about yourself. Now, see, here's a few things about me and scrapbooking, and scrapbooking about me. This is the 6th scrapbook page I have ever done. My main issue is that I am a terrible photographer and photo editor. I just can't ever seem to make it come out right! Then there are the self photos - none that I am very happy with, so I used the one from our family Christmas card. (If you are going to be meeting me next week, I still kinda look like this, just a little fuller in the face. Hey, what can I say, hubby had some serious medical issues these past 6 months, and I'm a stress eater.) So there you have it. Though I was reasonably pleased with how this turned out, seeing as I am not a scrapbooker by nature. Cards are just so much faster, and there is less space to fill up, lol! I started with a basic layout copied from a book I have called From Fine to Fabulous. This was going to be a very simple page until I re-read the challenge and realized I had to put more stuff on it! So I think I was able to accomplish the goal while maintaining a balance and making it all work together instead of looking like it was just thrown on there. 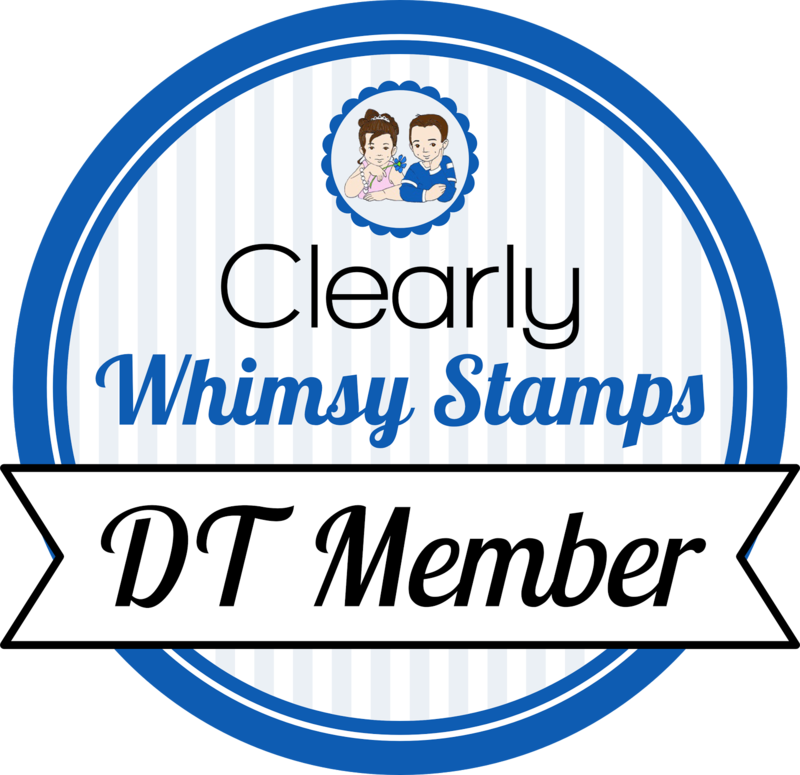 Be sure to see what the other team members have created, and post a link on the Stamp Something blog if you play along. Which I hope you do because you could win stuff! I am also happy to report that swaps for convention are done - I finished them Wednesday afternoon, woohoo! I didn't count how many I made, but I think it was about 100. I will try to schedule some posts with my swaps for next week when I am gone. Now on to prepare for this weekend's stamp class. Yikes, what was I thinking trying to squeeze all this in! My samples are made, I just have to cut paper. yes, you did create perfect balance on this page. it is great! Don't get caught up in making the pictures perfect, it is the subject matter that is important-just get those pictures onto pages. Your fabulous creativity will shine through in other ways, just like on this page. I'm going to have to scrap today. This is fantastic Becky! For someone who doesn't scrap, you'd NEVER know it! Love the layout and colors. Fabulous titles and embellishments. Great photo too. Have a great weekend! Becky - for a self-proclaimed non-scrapper, you totally rocked this challenge. I love how you scraplifted and made it your own! Fabulous job - you should do it more often. Becky, your page is awesome! I love the layout and your buttons with the circles behind them, the piercing too! Great work. Thanks so very much for the sweet and pretty birthday card I received this week. So thoughtful of you, and I really appreciate it.Getting good mail is a treat at our house, but getting real good mail is extra-special! This is an awesome page! Girl, you need to scrapbook more! Not a scrapbooker??? Holy moly girl.....you could have fooled me!! Your page is perfect! Becky, this page is wonderful! you are a talented scrapbooker as well as card maker! Can't wait to meet you in person... only a few days away now! Becky, this is beautiful! You did a wonderful job! You definitely should scrapbook more. Your obviously good at it =). Reasonably please??? Are you kidding? Your scrapbook page is AWESOME!!! You should try your 7th! I agree with Angie, you need to scrapbook more! This page is perfect!! !